Wine and tarragon make it French. Lemon and cinnamon make it Greek. Available in June, garlic scapes are the flower stalk of the garlic. We are taking garlic scapes orders right now! The entire stalk and flower are edible. With mild garlic flavor and aroma, they are wonderful additions to stew, roasts, marinade, salads, sandwiches, sauces, bread, pasta, pesto, stir-fry, roasted, or even steamed and eaten as a vegetable. The possibilities are endless! 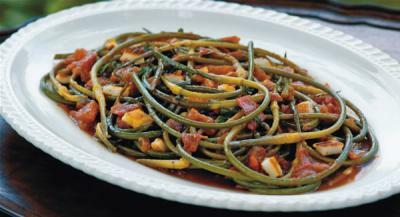 We have tried many of the following recipes using garlic cloves or scapes (and many more! ), although a few use scapes specifically for their size and color. If you don’t have scapes, use a few cloves of garlic and see how it goes! Oh, and before you cook with garlic next time, check out this video to learn “How to peel garlic in 10 seconds” because it does work! Scapes can be frozen whole, or diced and bagged for freezing! Simply wash, mince (you can even use the tip (flower), or can cut it off if desired), bag, and freeze. Mix the dough in a bread machine for ease, or try tubes of biscuit dough from the grocery store instead of homemade bread. I’ve not used the biscuit tubes, but they work for cinnamon Monkey Bread, and might work if you aren’t a homemade bread baker. Add ingredients to bread machine and set on dough cycle. When finished, place dough on lightly floured surface and pat to 1/2+ inch thickness. Cut dough into about 32 pieces. Dip dough chunks into the garlic/scape mixture and place them butter-side down in a greased bundt pan. Continue dipping and layering dough with butter side down until all dough is in the bundt pan. Bake at 375 until brown (15 to 25 minutes, depending upon the size of the cake pan). Invert onto a serving dish and serve warm…maybe with some additional garlic butter to dip the pieces in! Make crust and partially bake. Poke holes with a fork around the crust, except for the outer 1″ edge. Mix the veggies with the cream cheese and Ranch dressing. Salt/Pepper to taste. Spread on crust. Top with chicken, bleu cheese, and scapes, then mozzarella cheese. Bake at 350 degrees until the cheese bubbles and it’s hot! An easy, colorful, and healthy main dish using fresh herbs, and vegetables…perhaps from your own garden. Prepare pasta as directed, drain, return to pan, and cover. While pasta is cooking, heat diced chicken breast in approx 2 tablespoons of olive oil in a skillet. Remove chicken, set it aside, and cover. Add approx 2 tablespoons of olive oil to skillet and turn heat to medium-high. Saute onion, peppers, carrots, scapes, and garlic until slightly tender. 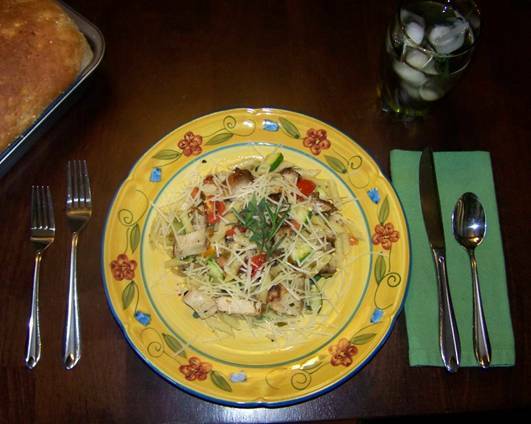 Combine chicken, vegetable mixture, and pasta. Place in serving the dish. Top with freshly cracked pepper and grated cheese. Garnish with rosemary or oregano sprigs. Serve with homemade garlic bread topped with garlic scape butter. *You can use store-bought pesto in place of the fresh herbs. Substitute approximately 3 heaping tablespoons of pesto for herbs. More or less subject to taste. This pasta is fantastic as a meal served with a big garden salad and some crusty bread. If desired, add a half-cup of fresh, lightly cooked peas to the mix for a little added nutrition (and sweetness). Set a pot of water to boiling on the stove and cook the Campanella pasta (or desired shape). While it’s cooking, cook the bacon over medium heat until browned. Remove the bacon pieces with a slotted spoon and add the garlic scapes. Cook until soft (2-3 minutes). Remove from the pan with a slotted spoon. (Drain both the bacon and the garlic scapes on a paper towel). Whisk together the eggs, salt, and red pepper flakes. When the pasta is done, quickly remove it from the stove and set a different burner to low heat. Drain the pasta and add it back to the pot, on the burner set to low. Stir in the garlic scapes and bacon. Add the egg mixture and stir feverishly for 3-4 minutes until sauce is thick and creamy. Don’t let it overcook or it will be gloppy. Sprinkle the Romano cheese in, a little at a time, and stir to combine. Don’t add it all at once or it won’t mix throughout the pasta as well (since it will clump). 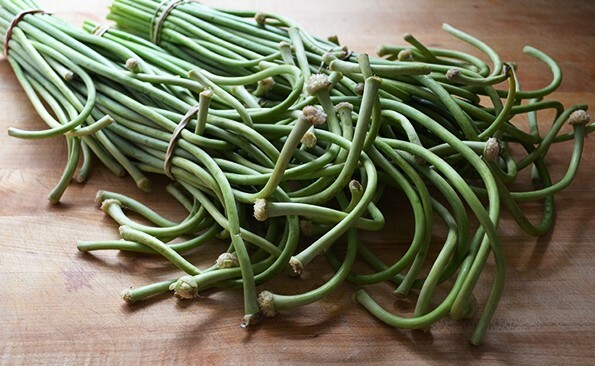 Chop the garlic scapes into 3-inch lengths. Put it in the food processor and process until pureed. Add the parmesan and walnuts and process until smooth. Add lemon juice then slowly add the olive oil as the food processor runs and continue until all the oil is combined into the garlic. Store in an air-tight jar in the refrigerator for up to 2 weeks or freeze. Pesto is wonderful on bread, sandwiches, pasta, focaccia, or on meat such as chicken and fish. In a food processor, process garlic scapes with lemon juice, salt, and pepper until finely chopped. Add cannellini beans and process to a rough purée. Spread out dip on a plate, drizzle with olive oil, and sprinkle with more salt. Serve with bread, tortilla chips, etc. In a container, combine oil, vinegar, honey, and garlic. Cover, and shake until blended. Set aside for 45 minutes, to allow flavors to combine. Shake again before serving. Once the vinaigrette is a couple of weeks old, it should no longer be used on salad. Pour the left-over vinaigrette over chicken breasts and marinate all day. Bake in a casserole dish for extremely moist, tender, and tasty chicken! Preheat the oven to 350 degrees. Cut about 1/2-inch off the top of the garlic heads. Place on a sheet of foil and drizzle with a bit of olive oil and season with salt. Wrap the foil into an “envelope” and place on a baking sheet. Transfer to the oven and cook until soft, about 1 hour. Remove from the oven and set aside to cool and then peel. Combine the garlic, vinegar, parsley, and honey in a blender and puree until smooth. With the motor running, slowly add the oil in a steady stream until emulsified. Season with the ¼ teaspoon salt and pepper. Alternately, combine the ingredients in a medium-sized mixing bowl and whisk until emulsified. With a hand blender blend the first 4 ingredients for 1.5 minutes, use a tall-sided container so it does not splatter. Add 1 egg white and blend for 20 seconds add the second egg white if it does not solidify. It should be the thickness of margarine. Serve with meat or use as a sandwich spread. Heat the oil in a sauté pan and add sugar. Stir to caramelize the sugar for about 2-3 minutes and add the scapes. Cover and sauté over medium-high heat for no more than 3 minutes, occasionally shaking the pan to prevent scorching. After 3 minutes, add the tomatoes and wine. Stir, then cover and reduce heat to low; continue cooking 5-6 minutes or until scapes are tender but not soft. Season, then add the parsley and halloumi. Serve warm or at room temperature. Haloumi Cheese Note: Haloumi cheese is a goat and/or sheep cheese made in Cyprus. It can be sliced and grilled or fried in a skillet, and it doesn’t melt. Other salty cheeses such as cheddar or aged chevre can be substituted. Grilled scapes are sweet with a mild garlic/onion flavor. Even our children love them! Wrap scapes in tinfoil with a little bit of olive oil. Some people just lay tinfoil on the grill, add oil, and grill uncovered. Salt if desired, and enjoy! The garlic powder you buy in the store may contain dehydrated and bleached shucks, stems, etc. so the actual amount of true garlic in store-bought garlic powder may be minimal. Homemade garlic powder is so superior…a must-have item in our kitchens! Process again after dehydrating until the correct consistency of powder is reached. Store in an airtight container, and enjoy! Boil the water, vinegar & salt solution. Pack hot jars with whole scapes, 1 fresh basil leaf, a pinch of chili flakes (depending on your spice tolerance) and then the brine. Put on lids, place in a hot water canner and boil for 45 minutes. Leave at least 2 weeks before serving to get the best flavor. Heat the butter in a large saucepan over medium heat, then add the scapes and sauté for 2 minutes. Add the potatoes and stock, cover, and simmer for about 20 minutes, or until the potatoes are cooked through and beginning to break down. Season with the lemon juice, salt, and a few grinds of pepper. Whisk in the cream for a silkier texture. If the soup tastes flat, add salt a few big pinches at a time until the flavors really pop. I use jelly jars and about 4 bulbs separated and peeled; use 1 third cup Tamari sauce, 1 third honey, and 1 third water; let it stay in the fridge for a month at least. I use the marinade to stir fry when the garlic is gone, and I like to bake chicken with the cloves, as they get caramelized. You can use larger jars for your own use but the jelly jars make nice gifts. Enjoy! Chop scapes in one-inch pieces, sauté in brown butter and add fresh sweet corn. Use as you would asparagus. I bet you saw that coming. Add to an omelet or a frittata, a.k.a. the ultimate refrigerator velcro. Makes salads and pasta a bit more interesting. It has a “secret ingredient” potential. Grill, roast, or broil with olive oil and salt. Garlic scapes sautéed in butter are excellent with mashed or lightly browned diced potatoes for a quick side dish. Puree with your favorite dips to give it a subtle garlicky punch and a cool shade of green. Stir-fry with rice, noodles, vegetables, or meats. Add finely chopped garlic scapes to bread dough.